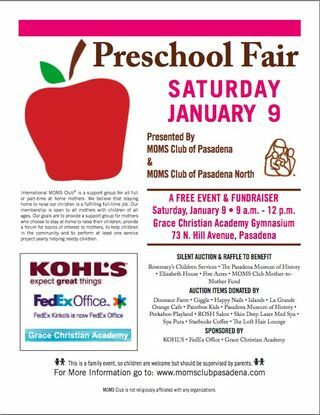 The MOMS Club of Pasadena will hold its Preschool Fair this Saturday from 9 AM-noon at the Grace Christian Academy, 75 N. Hill. Several Altadena-area preschools will be represented, and a silent auction will benefit Five Acres, among others. For more information, go to www.momsclubpasadena.com.